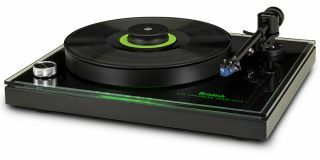 McIntosh expands turntable range with ‘entry-level’ MT2 Precision | What Hi-Fi? The £4995 MT2 Precision is considerably more affordable than the MT5 (£9000) and MT10 (£13,700) models it sits beneath. Another month, another McIntosh product - we’ve lost count of the number of launches the US brand has announced in the last six months. There’s been a 1200-watt monoblock amp, flagship SACD/CD transport, and its first hybrid integrated amp to name just a few. What with the expansion of McIntosh’s catalogue, then, the introduction of a third turntable isn’t wholly surprising. The belt-driven McIntosh MT2 Precision Turntable plays 33.3 and 45rpm records, and, perhaps surprisingly at the price, appears to be about as plug ‘n’ play as turntables get. McIntosh says it’s 'virtually ready to use out of the box' as the tracking force, anti-skate force, cartridge overhang and arm height are all preset in the factory. The MT2 has a moving coil cartridge McIntosh says has sufficient output to be compatible not only with moving coil phono inputs but also moving magnet equivalents. The cartridge design marries an alloy cantilever with an elliptical diamond stylus, while the tonearm is constructed from ‘lightweight yet rigid’ dural-aluminium with damping materials. New damping methods have also been applied to the bearings. The heftiness of the inch-thick polyoxymethylene outer platter helps resist and absorb external vibrations. The inner platter is machined from CNC-precision aluminum, and both spin on a steel shaft. The power supply is completely decoupled from the chassis to help reduce mechanical interference too. As sure as the tick on a Nike vest, the (admittedly gorgeous-looking) McIntosh turntable features the brand’s trademark green aesthetic - here, a subtle green glow emanates from beneath its platter and on the edges of the plinth. Naturally, a dust cover is included for protection. Priced £4995, the MT2 Precision will be available in the UK in the summer. April 2018 issue now on sale!